This Blue is not “supposed” to be here, but he looks like he thinks I am not supposed to be here. Just back from a four day circuit in the forest on the west side of the Lomami and I am real excited – I mean EUPHORIC. If any of you were here we would be toasting with mugs of coffee and Nido milk! And hey, I could offer you tea if you prefer that. First off – the forests are different here from the low-lying forests of the Salonga national park where we did bonobo surveys a year and a half ago. There is a lot of red clay soil rather than the sandy soil of Salonga. 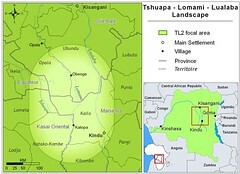 It is more like the high forests I know from the east (Ituri) and the north (Cameroon). Also different: there is lots of fruit and, therefore, -no surprise- lots of monkeys. In fact this is going to be a monkey-fest post because there is just so much to say about monkeys. Just two kilometers out of Obenge, yep, you guessed it, Bonobos again. And a mother and her baby just sat and stared at us… This is the third time I’ve seen them and, I’m not bored yet. The photo posted at the top here looks like a blue monkey, right? But, there’s not supposed to be any blue monkey on the west side of the Lomami River, or at least not according to the best information available anywhere and that is in the African monkey-bible: Histoire Naturelle des Primates d’Afrique Centrale. 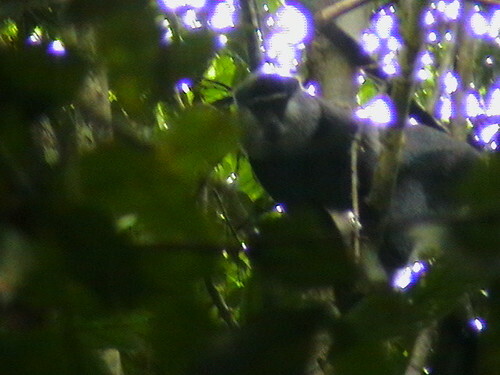 This Blue does look rather like the monkey that is supposed to be on the east side of the Lomami, Cercopithecus mitis heymansi, but wouldn’t you say that the Blue in the photo above has an awful light-colored back? And get this: We not only saw the “expected” Black Mangabey (Lophocebus a. aterrimus) and the spectacular mona monkey (Cercopithecus wolfi wolfi) – alas we saw it being eaten by an eagle – and the expected De Brazza’s monkey (Cercopithecus neglectus), but I am hearing rumors of several other monkeys. The local guide that was with me and is from this area insisted that they have the owl-faced monkey here. He pointed it out in the book (that same monkey-bible). If that is true it is a first. And then there is a monkey that I only glimpsed this morning and did not recognize. Unfortunately I wasn’t quick enough to get a photo, nor did I see it long enough to really describe its characteristics. Just wait, though, I’ll get a good look real soon. And then there is the “unknown” monkey that we found in captivity in Opala – John will write about that one, right? Because I did get pictures of it and he sent them around to several primatologists who have commented on it (without agreement). This is getting ridiculous and I love it. I’ll be wondering around near Obenge tomorrow with my camera. Who knows, maybe I’ll see a mountain gorilla or an orang-utan… well ok, that’s a wee bit excessive. Here is the majestic center of Obenge and its only “road”. 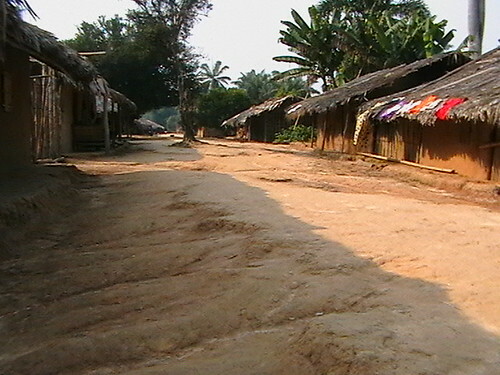 This is the last village until the savanna, five days steady motoring in the dug-out. This entry was written by Terese Hart, posted on 2007-07-08 at 4:27 am, filed under Bonobo. Bookmark the permalink. Follow any comments here with the RSS feed for this post. Post a comment or leave a trackback: Trackback URL. Wow, Ash, it sounds really exciting. When was the last time I heard inventory folks talk about so much wildlife in DR Congo? Keep up the photos and stories. Incredible to think we are following you “live” from a place that didn’t even see a missionary. Or almost!